This manuscript seems to contains three separate works, one of which calls itself 'Laeceboc', that is, a leech-book ('leech' is an old-fashioned word for a physician). A colophon suggests that it was written for someone named 'Bald'. On the basis of the style of the handwriting it has been attributed to the scriptorium of Winchester Cathedral. 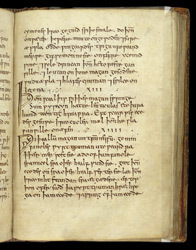 The lower initial is the Anglo-Saxon letter 'wynn', and the upper initial is the Anglo-Saxon 'thorn', pronounced like 'th'. In later manuscripts and printed books, Thorn was often written like a 'y', which has led to the misunderstood use of the word 'ye' (as in Ye Olde Coffee Shoppe), which should be pronounced 'the', not 'ye'.